Papaya is one of the most nutritional fruits, rich in vitamins, carotenoids, flavonoids and other antioxidants. Previous studies showed phytonutrient improvement without affecting quality in tomato fruit and rapeseed through the suppression of DE-ETIOLATED-1 (DET1), a negative regulator in photomorphogenesis. This study is conducted to study the effects of DET1 gene suppression in papaya embryogenic callus. Immature zygotic embryos were transformed with constitutive expression of a hairpin DET1 construct (hpDET1). PCR screening of transformed calli and reverse transcription quantitative PCR (RT-qPCR) verified that DET1 gene downregulation in two of the positive transformants. High-throughput cDNA 3′ ends sequencing on DET1-suppressed and control calli for transcriptomic analysis of global gene expression identified a total of 452 significant (FDR < 0.05) differentially expressed genes (DEGs) upon DET1 suppression. The 123 upregulated DEGs were mainly involved in phenylpropanoid biosynthesis and stress responses, compared to 329 downregulated DEGs involved in developmental processes, lipid metabolism, and response to various stimuli. This is the first study to demonstrate transcriptome-wide relationship between light-regulated pathway and secondary metabolite biosynthetic pathways in papaya. 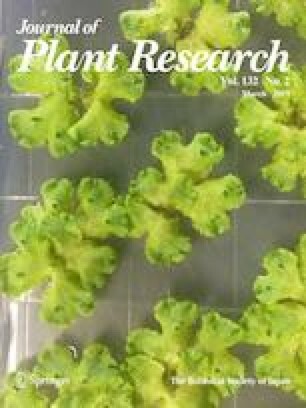 This further supports that the manipulation of regulatory gene involved in light-regulated pathway is possible for phytonutrient improvement of tropical fruit crops. The online version of this article ( https://doi.org/10.1007/s10265-019-01086-x) contains supplementary material, which is available to authorized users. The authors wish to thank research supports from the Malaysian Ministry of Science, Technology and Innovation (MOSTI) Sciencefund Grant 02-01-02-SF0907 and Universiti Kebangsaan Malaysia Research University Grant (GGPM-2011-053). We also thank the two anonymous reviewers and editor for their constructive comments in improving this manuscript. Conceived the experiments: NDJ, NMN, HHG. Designed and performed the experiments: NDJ, ERR, HHG. Analysed the data: NDJ, HHG. Contributed reagents/materials/analysis tools: HHG. Wrote the paper: NDJ, HHG, ERR, NMN. All authors read and approved the final manuscript.